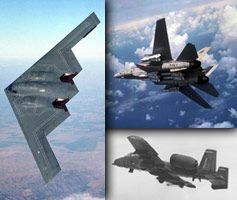 Northrop Grumman owns the vehicle names and weapon system designator trademarks for products manufactured by Northrop Grumman and its heritage companies, including Northrop, Grumman, Litton, Ryan, and TRW, as well as for certain product lines acquired from Vought and Fairchild Republic. For example, Northrop Grumman owns the trademarks to the following vehicles: A-10 Thunderbolt, B-2 Spirit, F4U Corsair and F-14 Tomcat. Northrop Grumman licenses these trademarks and related copyrights for use in toys, models, video games, clothing and other products. Northrop Grumman also licenses its video footage and photographs. For more information on Northrop Grumman’s policy on trademark licensing for your photographs, illustrations, and paintings of Northrop Grumman products, click here. For all other inquiries regarding the licensing of Northrop Grumman's images and trademarks, contact us.